Denny Jump (Bellevue, WA, United States) on 11 October 2010 in Landscape & Rural. 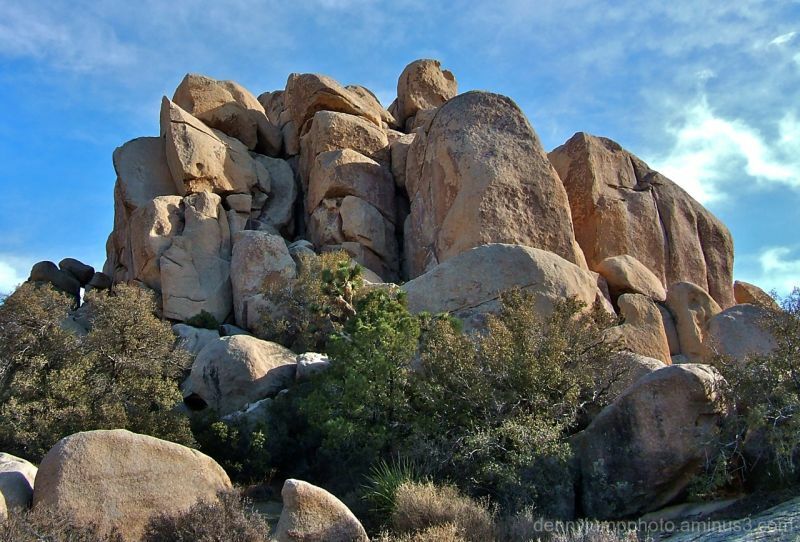 This massive and beautiful conglomeration of granite is found in the Hidden Valley area of the Park. Hidden Valley is rumored to have contained cattle stolen by rustlers in the late 1800. Yes, the old western movies had that right, people actually did steal other people's livestock back then. The rocks are amazing...but the sky is something else! PS..they still steal cattle! @Cruz: Yah wow (re rustling) that's what Julie just said!! Amazing...And yes I like the sky in this one too, rather mellow but something about it isn't there? Glad i was there to snap the shutter ;-) Thanks Cruz...have a great week! This is a beautiful outcrop. Denny, did you know that cattle rustling still goes on? I read a book by John McPhee that profiled a modern day cattle rustling law enforcement agent. Great composition of color and texture and I love the height you've captured here. @Steven: Hi Steven - Thank you very much. One of our favorite places in the world for sure!! Another great shot. I've got to get out there for some hiking one of these days. @B. Thomas: Just dont go in the summer - which at Joshua Tree means about the middle of May through September!! Like Texas :-) Seriously it is an awesome place...Thanks very much, Barbara! @john4jack: HI Jack - Thank you so much...same for yours today, that's for sure...wow it looks like you did have some awesome weather!! Congrats! @Bettina: Wow...You probably did not get your livestock back though did you? Oh well, as you say at least he felt remorse...Thanks Bettina!! Have a great day! @Nigel: Hi Nigel..Thank you sir All my best wishes to you!! This is so truly wonderful, God stacked these beautifully for you. @peter.K: Hi Peter - Thank you so much for visiting my blog page. I looked at several of yours and very much like them...and I really like your title, Maintain Eye Contact..that's a terrific title! Well done on all counts..all the best! @Bill Brown: Thank you Bill. I definitely appreciate it! It just doesn't seem possible that these all sit on one another! Just beautiful Denny!! @Becky: I know - I got that same feeling when I checked these out on the scree..."in person" they seem ok but on the screen it's like "whoa"! Thank you becky...your image is so cool today! All of the rocks seem to belong together there! Really cool shot Denny! A beautiful big stack of rocks nice photographed. Incredible shot and formation. Amazing things in nature, eh?